As Spring arrives, the warmer weather melts the winter freeze. The same thing is happening within you. After putting on your winter coat ~ adding warm layers, strengthening immunity, & tonifying to the bone ~ your system is now ready to lighten up. If this is done effectively, you have optimal health for Spring and Summer. If not, the system gets clogged, sluggish, rundown & worn out.The 21 Day Challenge to help you release winter’s accumulation & blossom into your best Spring yet. That is why Ayurveda places great importance on detoxification in early Spring. And that is why I joined the guided DYI detox program. I felt wonderfully grounded & nourished during the winter cleanse, yet it didn’t take long before I was back to some old habits. When life gets overwhelming, often the first to go is a healthy, well balanced diet. But that is the time when we should be nourishing ourselves the most. otherwise we become even more depleted. I’ve got a lot of new goals & plans ahead for this year, & I have really been working on creating more healthful patterns with food for the body, as well as food for thought. I am going to need a lot of nourishment to keep me going strong. Turning to Ayurveda as my guide has helped to light the way on this more wholesome path. When I apply daily Ayurvedic practices to my routine, on top of a clean, whole foods, plant based diet free of caffeine, refined sugar, gluten & alcohol I just feel so much better. Our cleanse began last Monday, & for the first week, we cut out all processed foods, gluten, refined sugar, caffeine, alcohol, & dairy & meat (which is easy for me as I don’t eat that anyway!). We focused on simple, light, seasonal foods & dishes such as salads, soups, steamed vegetables over rice pasta. In addition, we were given a new daily practice to add to our daily routine – taking nightly triphala, oil pulling, ghee tea, warm oil massage (abyanga), & daily yoga. While I was able to integrate most of the practices, I had a very difficult time with the dietary guidelines, mostly coffee to get me going & wine to unwind. With a such a jam packed week full of work, packing, & prepping for a move, & with kitchen goods & utensils packed away, I found myself either eating something I could grab & go from the store, or eating out. I did my best to stick with cleanse parameters, but lets face it, I cheated, a lot. By Sunday, I was so spent, so tired, & so ready to recommit myself to the cleanse. Week 2 began Monday, & it is all about centering our meals around kitchari, everyday. I absolutely fell in love with kitchari during the winter cleanse & couldn’t wait to make it again with Spring vegetables. 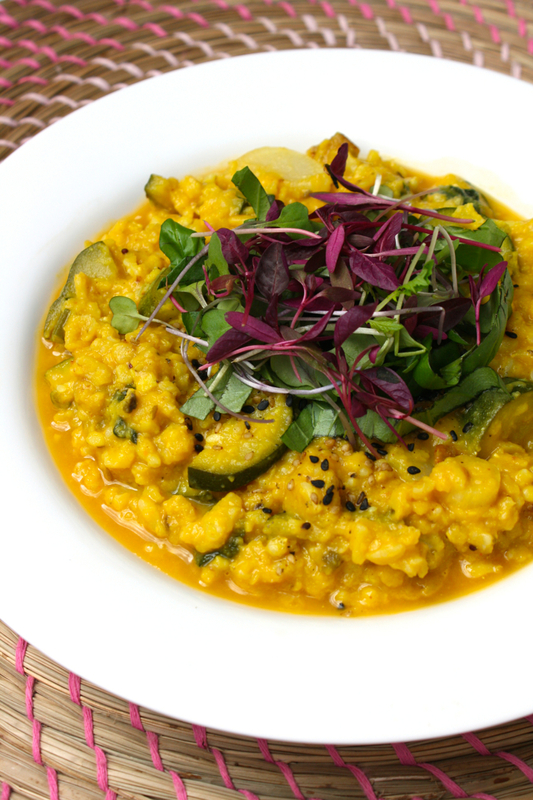 For those of you unfamiliar, kitchari consists of split mung & brown basmati rice, cooked gently with ghee, vegetable broth, Ayurvedic spices, & seasonal vegetables. Why cleanse with kitchari? Kitchari is an ideal food for healing, detoxifying, and restoring wellness. Ayurveda believes that all healing begins with the digestive tract, & kitchari gives it a much-needed rest from constantly processing different foods. The blend of rice and split mung beans provides essential nutrients & offers the body an array of amino acids, protein, fiber, & vegetables. The mixture of spices is believed to kindle the “digestive fire,” the Ayurvedic description for your innate digestive power, which can be weakened by poor food combinations. I was actually so excited to get my kitchari on the stove, that I got up at 5:30 am on Monday morning to prepare it! I was inspired by all of the beautiful vegetables in my produce delivery from the previous week, & added zucchini, baby turnips, & tastoi to the mixture. Depending on my cravings, I’ll with top with cilantro pesto & sliced avocado, or fresh basil & micro greens as shown here. In a medium sauce pan, bring vegetable broth to a low boil. In a medium saucepan warm the ghee. Add the kitchari spice mixture & sauté for one to two minutes. Add rice & mung beans, coat with the ghee & spice mixture & sauté for another couple of minutes. Add vegetable broth, bring to a boil reduce the heat to medium-low. Cover & cook for 20 minutes, then add zucchini & turnips. Cook for an additional 20-25 minutes until beans & rice are creamy tender (approximately 45 minutes total). Add tatsoi & stir until wilted. Season with liquid aminos or tamari & garnish with optional toppings. Finish with a squeeze of fresh lemon! ***I get my split mung beans & kitchari spice mix from Banyan Botanicals. You can also purchase a complete "Kitchari Kit." Oh, how I love kitchari! I find it so delicious & comforting. It has certainly become a staple around here. With that, I am off to return to unpacking, getting situated, before unwinding with tea & some evening yoga. I really love my new place so, so much. It already feels like home. Many good things are ahead, I just know it! Risotto Portobello, Vegan Wine & More!